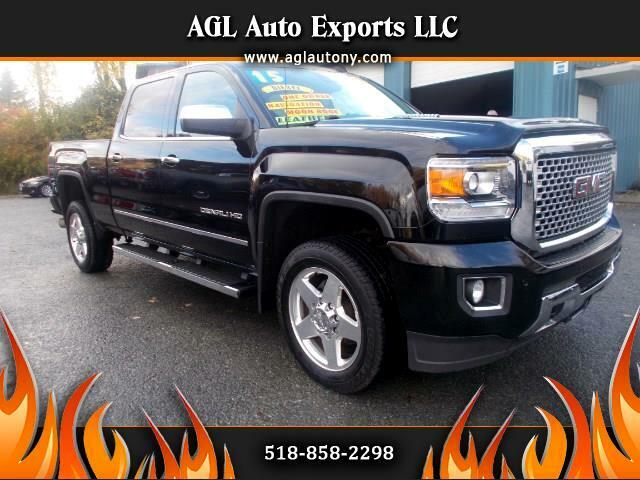 THIS BEAUTIFUL 1 OWNER 2015 GMC FLAG SHIP DENALI 2500 HD CREW CAB 6.6L DURAMAX DIESEL 4X4 HAS EVERY OPTION AND A GARAGE KEPT DOLL THIS IS A RAEL TRUCK SAFETY HAS DRIVER ALERT A GREAT PACKAGE TO AVOID COLLISIONS AND DRIFTING INTO ANOTHER LAN , ELECTRONIC FOOT PEDDLES , TRACTION CONTROL, FACTORY BRAKE ASSIST , HEATED AND AIR CONDITIONED SEATS , HEATED MIRRIORS, HEATED STEERING WHEEL , POWER SEATS , BOSE STEREO -6 DISC-AUX-BLU-TOOTH-MP3-AUX- NAVIGATION , SUNROOF, LEATHER IS SHOOROOM CONDITION NO WEAR ON LEATHER LIKE NEW! MANY MORE OPTIONS , TOW PKG , PARK ASSIST WITH BACK UP CAM , RUNNING BOARDS , FACTORY SMOKED WOOD GRAIN , HIGH TOP LEER INSULATED CAP WITH LIGHTS , POWER REAR SLIDING GLASS WINDOW WITH DEFROSTER , 20 INCH POLISHED CHROME FACTORY OEM, SPOTLESS ENGINE COMPARTMENT , HIGH OUTPUT XENON LIGHTS WITH FOG LAMPS , THIS WAS USED TO TRAVEL FROM CAPE COD TO THE NY BORDER ALL HIGHWAY MILES AND THIS TRUCK IS FOR REAL!! GOOD LUCK TO THE BUYER A CLASS ACT RIDE !